Does High Cholesterol Cause Leg Pain? Blood cholesterol is defined as the levels of lipoproteins within your bloodstream. 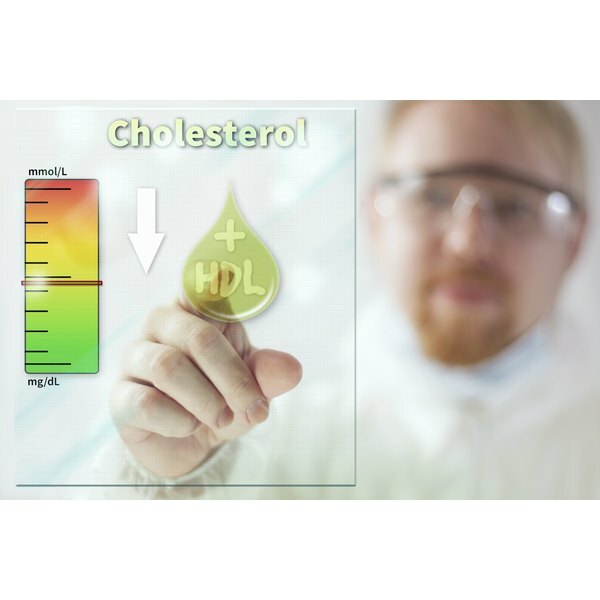 The two major classifications of cholesterol are high-density lipoproteins, or HDL, considered "good" cholesterol, and low-density lipoproteins, or LDL, also known as "bad" cholesterol. Normal levels of LDLs in the bloodstream range from 70 to 130 mg per dL, with higher LDL levels increasing your risk of health problems. While you may not notice the physical effects of high cholesterol right away, high levels of LDL in your bloodstream can cause negative side effects over time. One side effect of high cholesterol is a progressive narrowing of your arteries and hardening of the artery walls, a condition called atherosclerosis. High levels of LDL within your bloodstream eventually contribute to the formation of deposits, called plaques, on the walls of your arteries. This condition causes the arteries to narrow and harden, increasing the risk of an arterial blockage or blood vessel rupture. The symptoms of atherosclerosis can vary depending on the arteries affected, but may include weakness, chest pain, headaches and leg cramps. If you currently suffer from high cholesterol, lowering your blood cholesterol levels may help reduce your plaque deposits and cut your risk of complications due to atherosclerosis. Another potential long-term side effect of high blood cholesterol is an increased strain on your heart muscle due to the development of cholesterol-linked vascular disease. When your articles narrow, your heart must pump harder to push blood through your blood vessels, often leading to an elevation in your heart rate. This puts a strain on your heart over time. Without treatment or lifestyle changes, this heart strain may increase your risk of potentially fatal heart failure. Reduce your blood cholesterol levels by limiting saturated fat intake -- from fast foods, fatty cuts of meat, dairy fat and trans fats -- to help reduce your risk of heart failure in the future. In severe or advanced stages, high blood cholesterol levels can lead to stomach and abdominal pain. In addition to plaque deposits in your arteries, very high cholesterol can lead to fatty deposits within your ligaments and skin, as well your liver and spleen. The enlargement of your liver or spleen due to fatty deposits places pressure on other organs within the abdominal cavity, leading to unexplained stomach or abdominal pain. If you have a family history of heart disease or suffer from high cholesterol and develop this pain, seek immediate medical attention to determine the underlying cause, and to get your blood cholesterol levels under control. High cholesterol elevates your risk of having a stroke -- a condition caused by decreased oxygen to your brain caused by a clot or ruptured blood vessel. Cholesterol build-up in your blood vessels can cause a stroke by interrupting blood flow to your brain. Early signs and symptoms of stroke include facial drooping, weakness or numbness on one side of your body and slurred speech. Stroke is a life-threatening condition, requiring immediate medical attention. What Are the Signs and Symptoms of a Stomach Aneurysm?